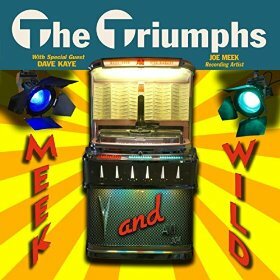 This is The Triumphs’ tribute to the work of famed record producer Joe Meek. Joe recorded many styles of music and ‘Meek and Wild’ offers a ‘jukebox’ full of great sounds, both vocal (15 tracks) and instrumental. (9 tracks). In addition to popular chart toppers like Telstar and Have I The Right, the spotlight also falls on rarities such as Ray Dexter’s The Coalman’s Lament and, from the Tea Chest tapes, Geoff Goddard’s Here Come The Good Times. There are five original tracks, all inspired by the work of Joe Meek. The Triumphs (Rob Bradford, Trev Faull, Ken Ledran and Ray Liffen) have as their special guest Dave Kaye, who recorded with Joe Meek. One of Dave’s tracks is He’ll Only Hurt You, a powerful ballad which he recorded with Joe, but which was never released at that time. Now you can hear it in a brand new arrangement with Dave backed by The Triumphs. The album’s 12-page booklet includes descriptions of all the tracks and pictures of the band with many of the original Joe Meek artists that they have had the privilege of working with, including Clem Cattini, Dave Kaye, Malcolm Lenny (The Packabeats), Ray Dexter, Bobby Rio and Danny Rivers.